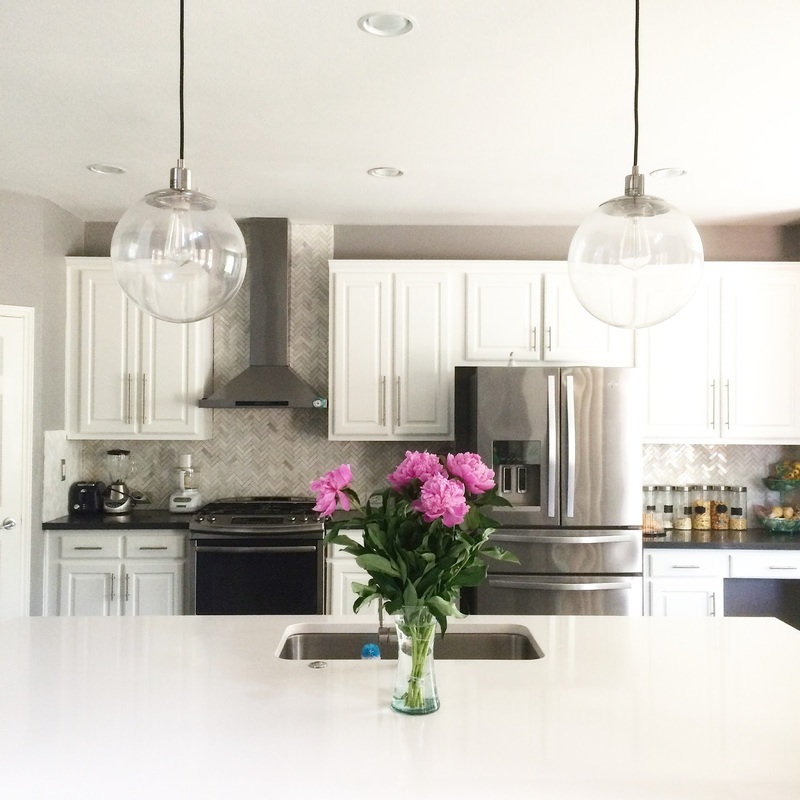 Yesterday I showed you the before photos and all the details on how we remodeled our kitchen. You can see that post here. And now it is time for the after shots! 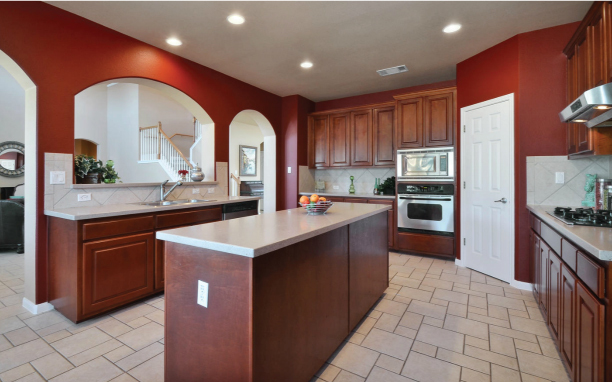 kitchen and really give it a wow factor. I love to fill the island with food and snacks during parties. It is the go to hang out and nibble and talk place. I also love being able to cook in the kitchen and have the kids sit at the island and craft or draw. Even if they are in the living room, the open concept makes us feel connected. with cookie cutters, chocolate molds, food color, and piping tips. I mentioned yesterday that the island cabinetry is painted gray to coordinate with the walls. 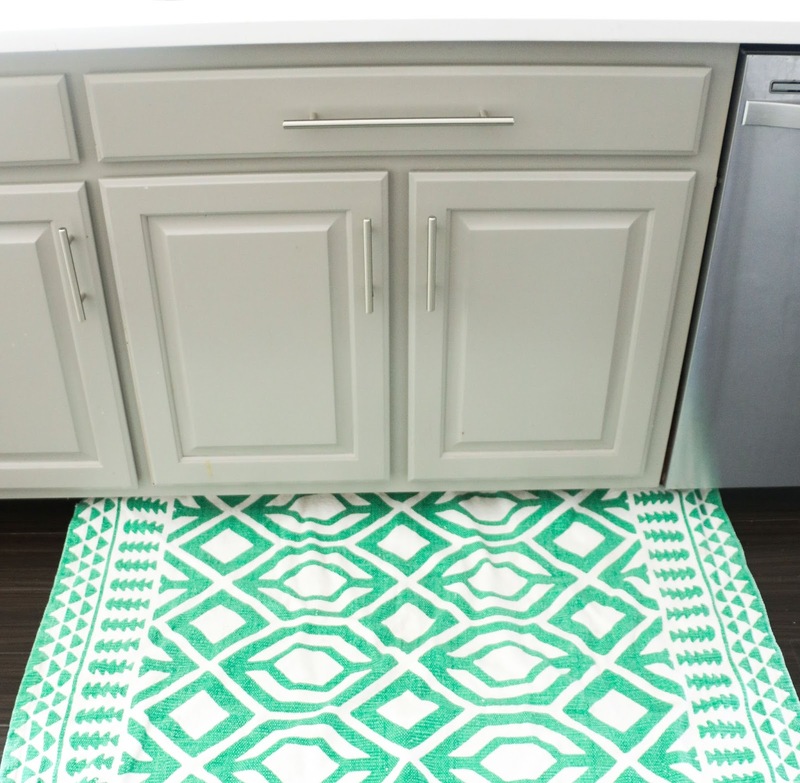 This is a shot of the cabinets below the sink that are gray along with this awesome kitchen rug that I got at Home Goods (I just wish it came in a bigger size!). Over to the right when you are looking into the kitchen from the living room is our eat in kitchen area. 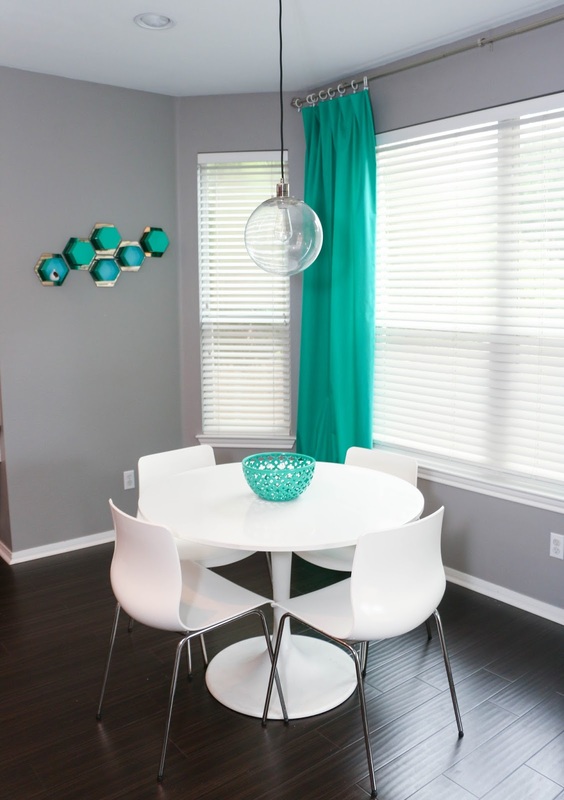 I went with a white Ikea tulip table and chairs for this space and accessorized it with emerald curtains and abstract art that I DIYed. 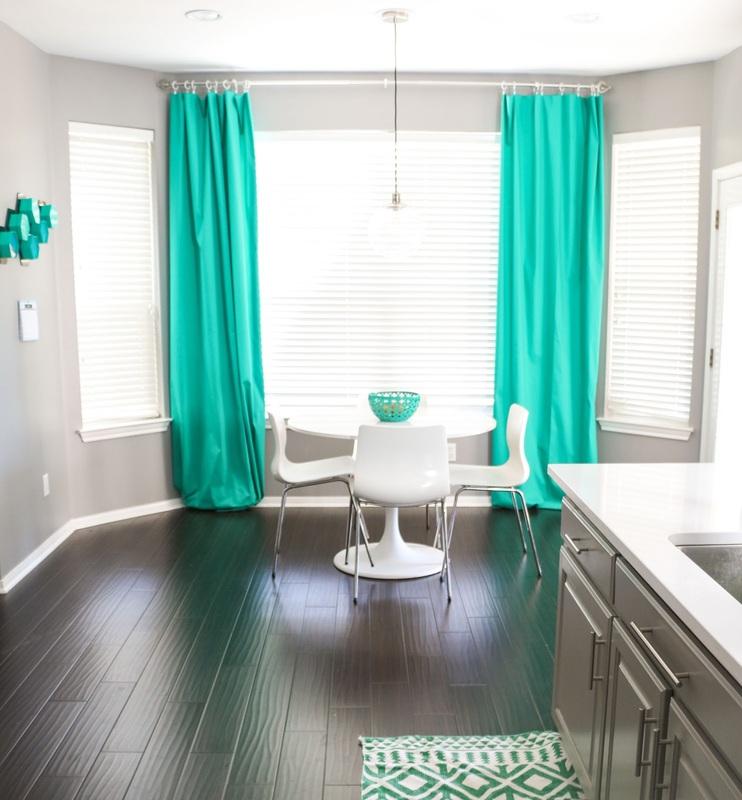 The emerald bowl that I purchased at Marshall’s was my inspiration for the whole emerald concept. The pendant light is from West Elm. Yesterday there were several in process shots of this space. I am pretty pleased with the final outcome despite the curve balls we were thrown during the remodel process (ordering the wrong oven first, having to get an extension for the range hood and customizing it to fit our space, etc..) This shot is also one of the most obvious ones where you can see around the edge of cabinets that the backsplash still needs to be grouted and caulked. Above is a full sized shot of the entire kitchen from the living room. 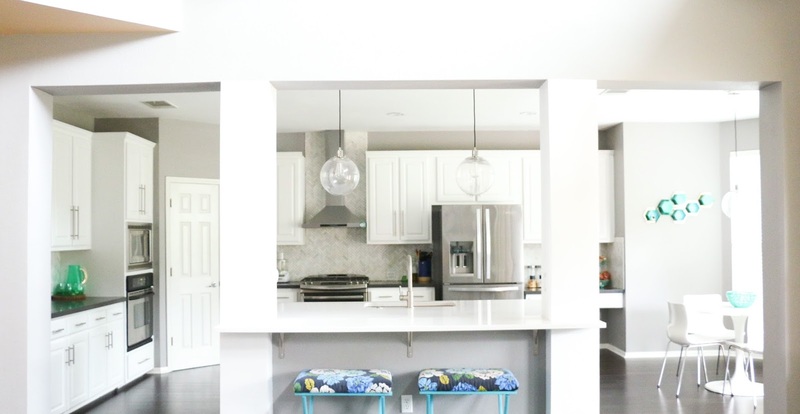 Taking out the middle island and enlarging the sink island created a much bigger space in the kitchen. 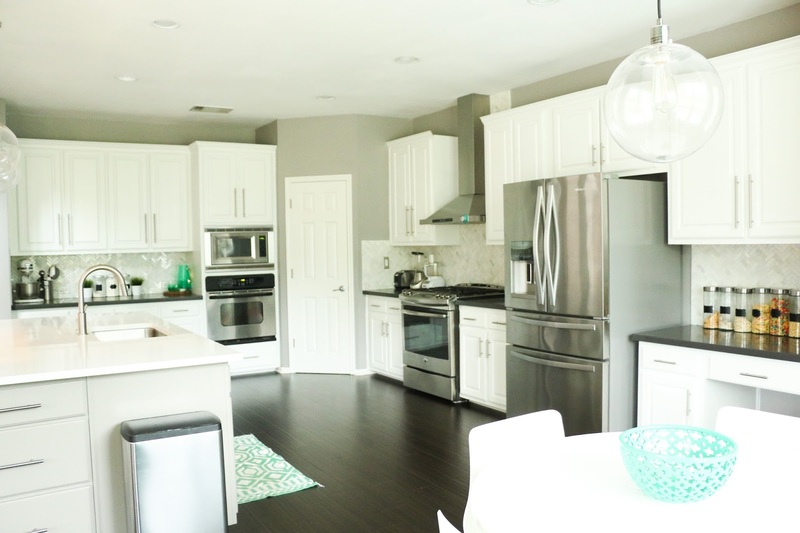 We can now easily have 10-12 people in the kitchen and it won’t feel cramped. Before with the skinny island, it was difficult to even cook by myself because I kept bumping into it. And now for the side by sides of the space before and after. 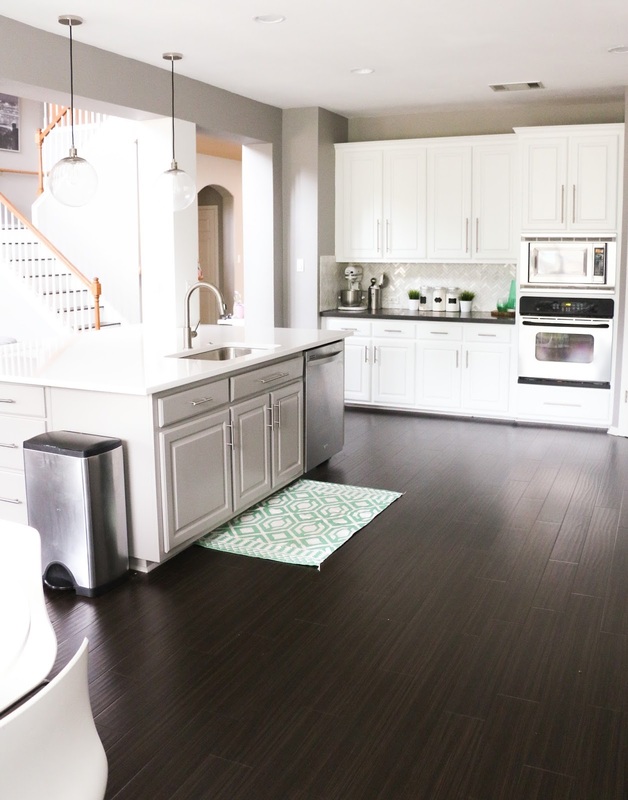 Pretty crazy what paint and new flooring can do! 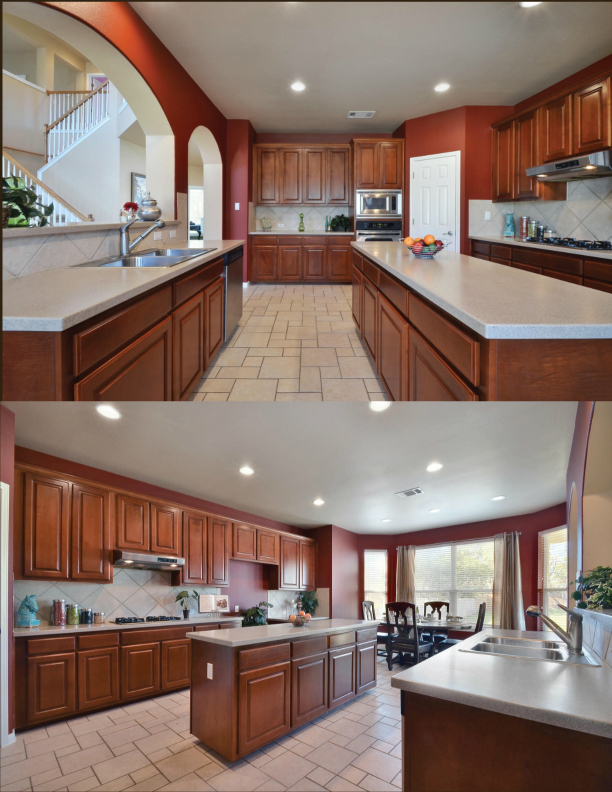 The total cost of our remodel was about $16,000 which included all the labor, materials, and new appliances. 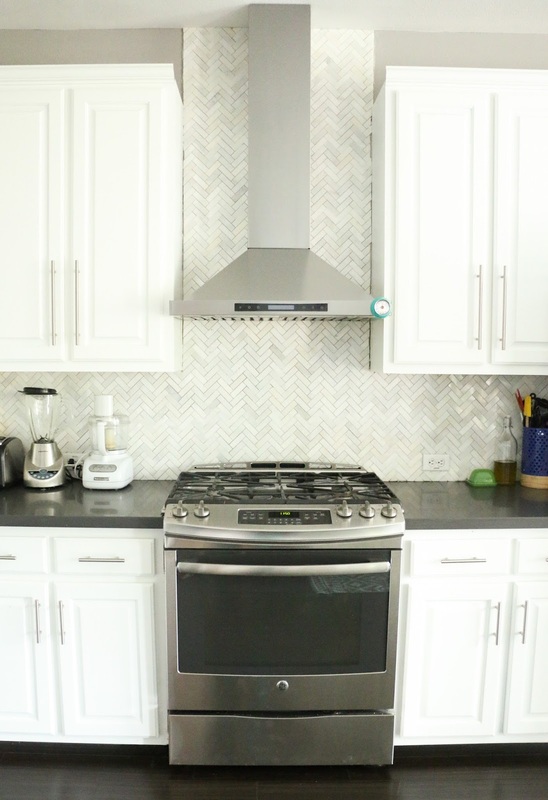 If you remove the appliance cost, the remodel was more like $12000 (this includes flooring, the contractor and all his fees, the electrician, two plumber calls, the new cabinetry for the island, the new sink and faucet, vent hood, backsplash tile and and all the accessories to install it myself, and counter tops). I think we got a pretty good deal for such a large scale remodel. What do you think of the after? Love your beautiful herringbone backsplash! What brand is it? I'd love to know details you can share. It is Allen and Roth and is available at Lowes. 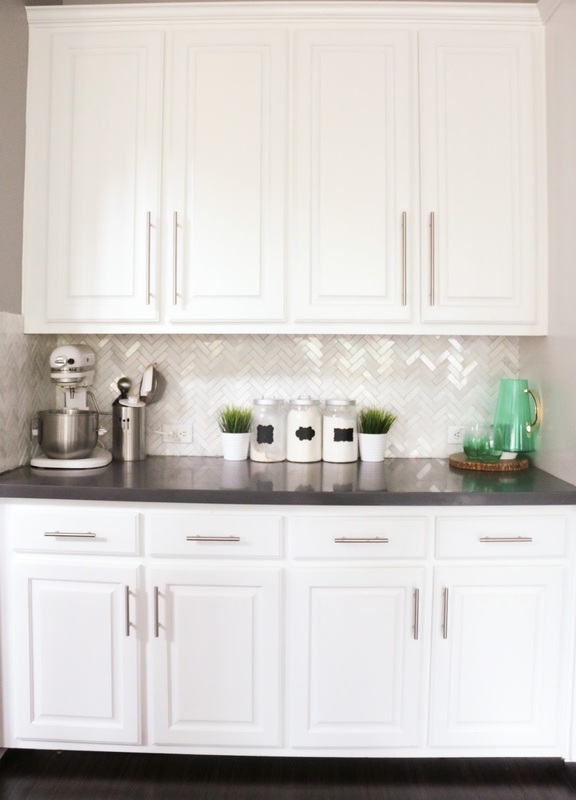 I LOVE your backsplash too!!! Is it marble Allen and Roth? I am not sure if it is true marble or not, but it certainly looks like marble. I have been reading your whole blog when my three year old twins go to sleep at night! I love it all! And then last night I discovered your gorgeous kitchen and realized you are in Austin, too. You did such an amazing job. I would be so appreciative if you can/would share your contractor info? We had a flood and have to gut everything. It's always awesome to get to go with someone who's had a good experience. Keep creating and writing. You are so talented! Oh thank you so much! I wouldnt say the people I used were great, but they weren't horrible, so I guess that's something. The company's name was Best Austin handyman. I also used JJ flooring for the floors and they were quite good. I have used them several times and am always impressed. Anyway, thanks for taking your time. And my toddler girl is completely in love with your site too…she wants to make cactus everything now!